1.First Download MyGalaxy App Here. 2.Now Open the App and Enter your mobile number. 3.Submit 6 digits verification code. 5.Click on "Next" four times you will see all offers. 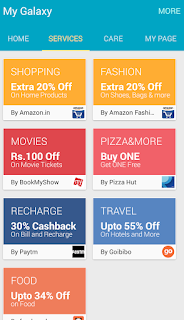 6.Go to Service Tab,under this you will see BMS,Paytm,many other offers click on anything what you want,Next click on offers,Now Generate the code.You will see your code in a rectangular box. 7.For 100 off ebay voucher Go to Home tab scroll down you will see 100 off ebay offer click on that and generate the coupon also. I have a trick for changing device model in secure method without editing build.prop.but i never post this because your mobile may be damage by changing phone model.If you have other device and have no pc or lappy and you want a BMS Coupon then Message us on Facebook with your number we will ask you a pin for verification then We will give you BMS Coupon. If you will request a trick for other device also under comment section then i will post it. 1).First Install Bluestacks and Bs Tweaker in your Pc. 2).Download Direct Apk of MyGalaxy app from Here. 4).Restart Bluestacks,You can see restart option in BS Tweaker On Upper side. 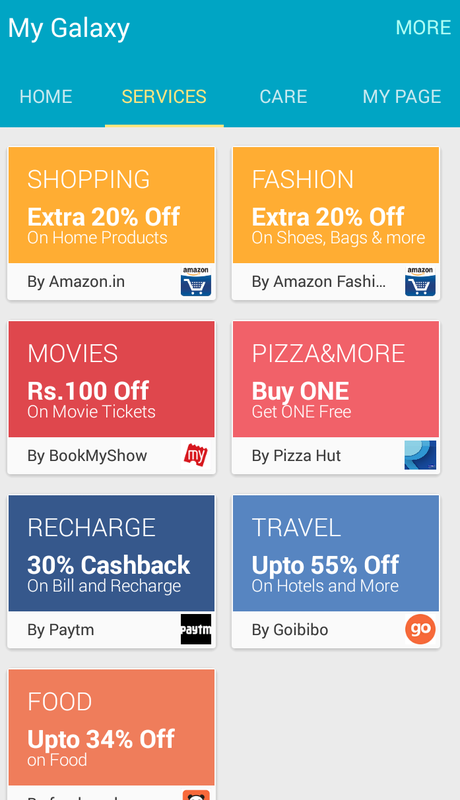 5).Open the MyGalaxy App Register in it with new number and Generate Bms Coupon. Note - Before Registering in My Galaxy App then Make sure you have signed up in play store with your google account,if my galaxy app give sync error then Go To Bluestacks Setting >> Advance Setting >> Under Accounts Click On Google then three doted line and click on sync Acc. 6).For Unlimited click on Bluestacks Setting >> Advance Setting >> Under Accounts Click On My Galaxy then three doted line and remove the account. 7).Go to Apps >> Clear data of My Galaxy App. 8).Change Guid,Adv Id,Android id with Bs Tweaker. 9).Restart Bluestacks,Again Open My Galaxy app,register with new number and generate a new code.Repeat this process unlimited times. 4.After completion of reboot, Open Xposed Installer again and goto modules, check (mark) infront of Xprivacy Again go to framework and soft reboot your device. 5).Go To Setting >> Under Accounts Click On My Galaxy then three doted line and remove the account. 6).Go to Apps >> Clear data of My Galaxy App. 7).Open Xprivacy >> Tick on My Galaxy App icon>> tick on phone & Identity >>Click on three doted line >> Setting >> Randomize Privacy Values >> Save.Go back and exit. 8).Again Open My Galaxy app,register with new number and generate a new code. 9).Repeat step 5 to 8 unlimited times.